If you are looking for some of the best beaches in Sardinia, head to the East coast. From Costa Rei, you can catch a bus (ARST) to Tortolì and once there go to Baunei.There are so many things to do in Sardinia, that the area also offers some of the best hikes in Europe: from Cagliari you can join one of the many guided tours to hike the Gorropu Canyon (the deepest in Europe). Things to do in Sardinia: go on a hike! The trek is not difficult, but it is easy to get lost so better having a guide. For more information, ask the cooperative that watches over the canyon. Make sure to wear appropriate hiking shoes and to carry plenty of water and food. Although the path is often shaded, weather in Sardinia can get pretty extreme and it does get really hot in the summer season. Once you finish the hike, you will be in the area of Dorgali. You can stop in Dorgali for a few nights, and stay at agriturismo Canales, completely immersed in the nature and with a gorgeous view over the lake Cedrino, and which offers delicious traditional Sardinian food. It also rents kayak to reach the source of Su Cologone. From Dorgali, you can go to Cala Gonone, from where numerous boats leave daily to the spectacular Golfo di Orosei, taking you to some ofSardinia best beaches, that can only be reached via boat or via a hike. There are many hotels and bed and breakfasts and there is also a camping site for travellers on a tight budget. In Golfo di Orosei, do not miss the long, sandy beach of Berchida. From Cala Gonone, you can reach Cala Fuili, from where you can start the free trekking to the beautiful Cala Luna, set of a number of movies including the recent “Swept Away” featuring Madonna and among Sardinia best beaches. Alternatively, you can go to Baunei and reach the plateau of Golgo (Altipiano del Golgo). From there, you can join together some of the best things to do in Sardinia – going on hikes, rafting, diving in freshwater underground caves, and visiting some of the best beaches in Sardinia. The wild wild east of Sardinia, as Lonely Planet calls it, is the best for outdoor activities. There you can sleep in a wonderful hostel immersed in nature and surrounded by animals left free to roam (there are rooms for any budget, including rustic cabins or pitching your tent, which only costs 5 euro per person per day). It is run by Cooperativa Goloritzè, which is the same that organises boat tours around the Golfo di Orosei leaving from Santa Maria Navarrese (around € 40 for the whole day, carry your own lunch), a number of hiking tours and the beautiful 7 day long backpacking trip “Selvaggio Blu” (wild blue) which takes you from beach to beach in a path across nature. You can eat in the delicious restaurant of the hostel (between €20 and €30 per person for a set menu which is enough for 2 people, actually – so be clever and order just one and share, you will not regret it and food will not be wasted; or else, you can pay a la carte). There is also a packed lunch service. If you manage to get a tip, get the number of one of the local shepards and go have dinner at his place. It will be a rustic set meal for about €25 (including drinks), where you can fill on his production of cheese, season vegetables, culurgiones di patate (potatoes and cheese filled fresh pasta, which is a local specialty), piglet and seadas (sweet fried cheese filled pastries served hot with honey). From Golgo plateau, you can do a number of independent and free activities, as there are hiking trails to some of Sardinia best beaches (calculate that you will be going downhill on the way there, and uphill coming back, but the duration is roughly the same) which you really can’t miss when you visit Sardinia, such as Cala Mariolu, Cala Sisine, Cala Biriola, etc., including what I value as one of the most spectacular beaches not only in Sardinia, but in the entire world: climbing paradise Cala Goloritzé. A walk in the woods, which will eventually open up to reveal the most crystal clear, transparent water you can imagine. The beach is tiny, a real gem where several sources of fresh water end, making the sea very cold but pleasantly refreshing on hot days. Cala Goloritzé is famous for its 143 meters spire hanging over the beach, which has been declared a UNESCO World Heritage site. Carry plenty of water and some food, there are no services at all on the route and at the beach. Going to the North of Sardinia, you can reach Olbia from Tortolì by bus. This is as a starting point to visit the world famous Costa Smeralda, home of some of the best beaches in Sardinia. If you enjoy a good nightlife, stay in San Teodoro, a lively village offering many shops, restaurants, ice cream parlours and bars. There are hotels, bed and breafasts and apartments for rents, and for those on a tight budget even a camping site. There are many beaches that can be visited in this area and, guess what?, access is free in all of them. If you travel with your own car, you will at most have to pay for parking. You can pick among many: Cala Brandinchi, Capriccioli, Baja Sardinia, Cannigione… and go for a walk in Porto Cervo. Amongst boutiques with prices accessible only to the richest, you can still go window shopping and have a gelato (which, by the way, will cost just like anywhere else). If you wonder where to go in Sardinia for something slightly, make your way to Porto San Paolo and catch the 10 minute ferry ride for a day trip to Isola di Tavolara: nobody lives there, there is just a small hostel and a kiosk! Further North, Palau is where to go in Sardinia to catch one of the boat tours the Maddalena Archipelago, offering the chance to visit Spargi, Budelli, Caprera and a famous beach known locally as Tahiti. 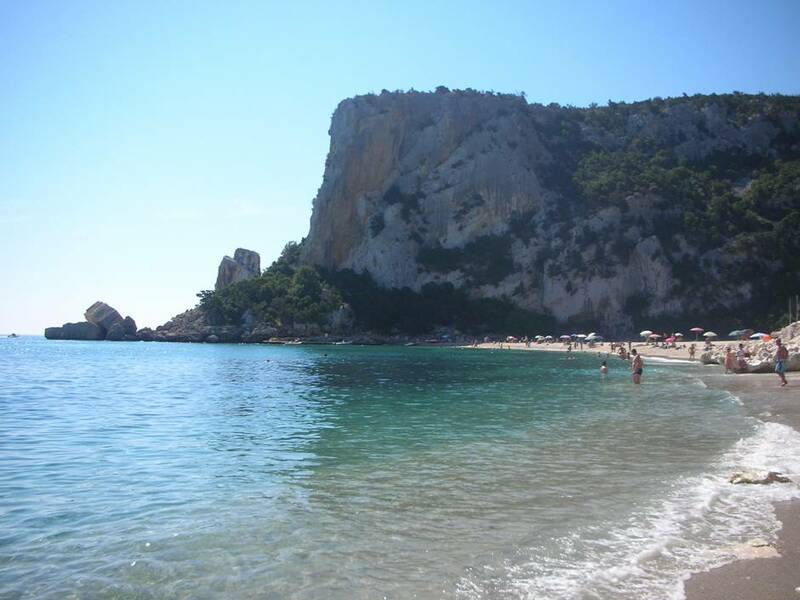 Can you deny Spargi is one of the best beaches in Sardinia? For information and prices, you can visit the sites www.giteinbarca.it and www.elenatour.it. Asking locally, you may be able to find a private company and local guide. This is more comfortable and faster (not to mention, there are less people on it) and if you are in a large group you may save considerably – the more people, the cheaper. Calculate an average price of € 40, but it will be totally worth it. Finally, you can rent your own small zodiac (the small ones do not require you to have a special license) if you are up to manouvering it! Not far from Palau, there is the lovely village of Santa Teresa di Gallura and, near it, the promontory of Capo Testa. The Torre di Longosardo (built around the 14th century under instructions of the king of Spain Philip the Second) is an interesting place to visit, and is found on the outer edge of the village. Following on the same route you can reach Castelsardo, with its beautiful Castello dei Doria, a castle built in 1102, and many other monuments and places of interest.